In the past week, we have seen tragedy hit a sacred place of worship. Similar to what occurred at the Tree of Life Synagogue in October, a perpetrator driven by hateful ideology senselessly targeted worshipers and took innocent lives. The Jewish Democratic Council of America (JDCA) condemned the horrific attack on two mosques in New Zealand in the strongest possible terms, spoke out against hate with a representative from the Muslim community, and reaffirmed our commitment to combating intolerance in all its forms. 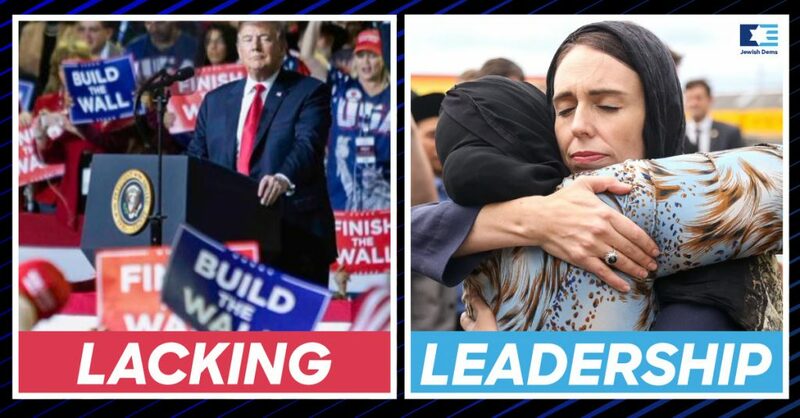 Unlike what occurred in the aftermath of the horrific attack in Pittsburgh, strong and principled leadership has emerged in New Zealand. Prime Minister Jacinda Ardern strongly condemned those who “espouse hate and fear” and immediately called for a ban on semi-automatic weapons. Only six days later, New Zealand’s largest opposition party announced that it supports the ban on semi-automatic weapons, and they will pass such legislation early next month. As JDCA praised this swift action, we noted that it shouldn’t be so hard to take similar measures to save lives in the United States. Gun violence is preventable, and we should take action to prevent the next massacre before it occurs. We must do more to combat this epidemic that has plagued our communities and schools, yet there has been an absence of leadership on this issue in recent years with Republican control of Congress and the White House. With Democrats now in control in the House, we welcomed the passage of gun safety legislation last month – the first time Congress has taken such action in decades – and are now calling on the Senate to do the same. We are also calling on President Trump to denounce white supremacy. Join JDCA’s call to action by signing our petition calling on President Trump to denounce white supremacy and signing our letter to your Senator calling for passage of gun safety legislation. Read on to learn about JDCA’s response to other events this week, including our rejection of President Trump’s false accusations regarding Democrats and Jews, our opposition to an “AIPAC boycott,” our response to Trump’s abrupt decision to recognize Israeli sovereignty over the Golan, and our support of the bipartisan anti-BDS bill. Finally, join our growing movement today by supporting JDCA. JDCA’s Halie Soifer joins with Wa’el Alzayat, CEO of Engage Action, in denouncing white supremacy and hatred in our political discourse. JDCA rejects President Trump’s false accusation that Dems do not support Israel, and reaffirms that it looks forward to participating in AIPAC’s upcoming Policy Conference. If you’ll be there, please come find us! JDCA expressed support for a bipartisan bill opposing the BDS movement and expressing support for a two-state solution to the Israeli-Palestinian conflict. A lot happens every week. Stay informed in real-time by following JDCA on Facebook, Twitter, and Instagram. Our work is not possible without your support, and we thank you for standing with JDCA as we fight for socially progressive, pro-Israel, and Jewish values.